Ed got his first job at Wake Forest College in 1954, while he was a seminary student at Southeastern. He became the part-time Baptist Student Union Director, working for Dr. J. Glenn Blackburn, pastor of the Wake Forest Baptist Church and College Chaplain. Ed was comfortable in this new job — after all, he had recently graduated from Wake Forest College and the Law School, and he knew the community and the students. Yet he also looked at the opportunity from the perspective of a brand-new seminary student. Where did he fit in this new vocation? 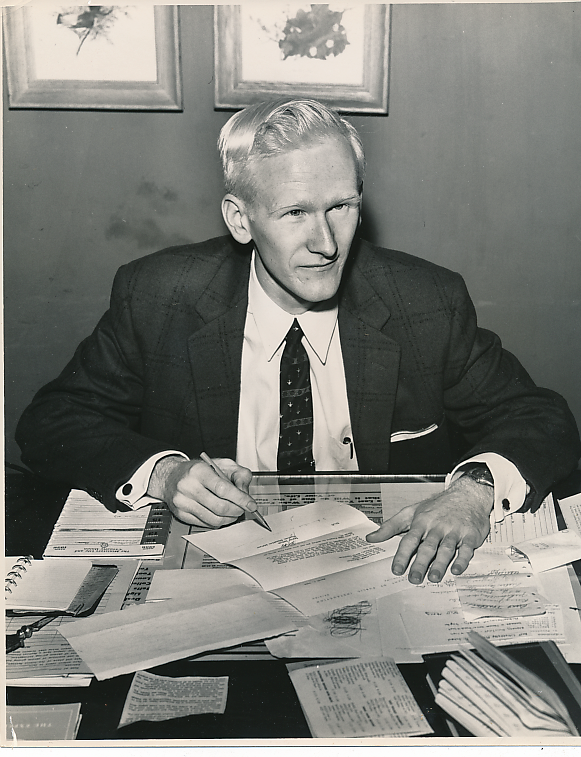 Ed stayed at Wake Forest as BSU Director and later as Baptist Campus Minister. Photo by Irvin Grigg. Right away, he had ideas for improving current practices. 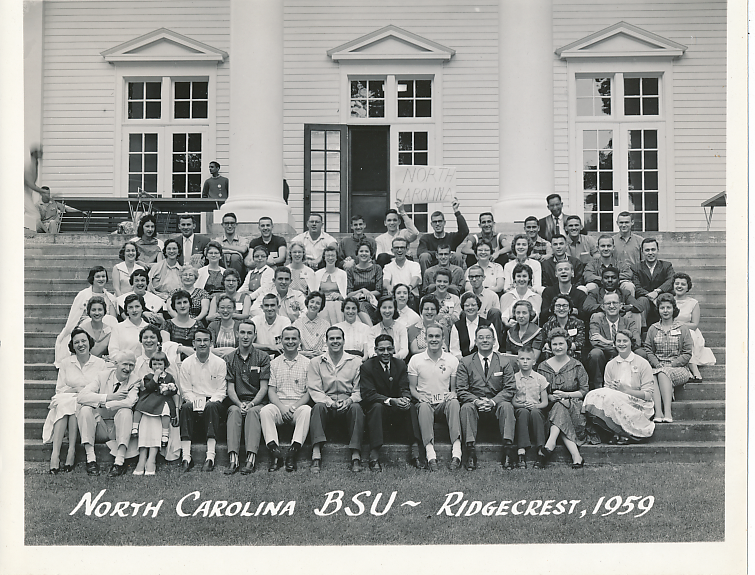 For example, in 1954, he began to envision a change to the pre-school retreat for the BSU executive board, held was held each fall just before the Wake Forest College school year opened. Ed proposed that all incoming freshman also be invited, an opportunity which would allow them to meet the BSU leadership and get to know more about the college at the same time. His proposal took shape in 1955, with two retreats held at Camp Kanata. Each year following, and for decades to come, he took initiative to improve and expand the retreat. After the move to Winston-Salem, he began to invite campus ministers from other denominations and faculty members to take part. As the retreat grew, it was moved to a permanent home at the YMCA’s beautiful Camp Hanes in Stokes County, NC, one hour from the campus. Over time, the pre-school retreat — now the Pre-School Conference — became a four day program of mini-courses taught by faculty members, discussion groups on a variety of topics, sports, swimming, time for meditation and silence, worship, guest speakers, nightly music and campfires. The Conference ended with a communal worship service the final morning before students, ministers, and faculty returned for the new school year. Changes in Pre-School Conference between the mid-1950s and the mid-1960s reflected what was happening with Wake Forest’s Campus Ministry. Ed and his colleagues were gradually developing a shared vision to incorporate other denominations of faith and work together to nurture a religious presence on campus. Ed and Jean had moved with the college to Winston-Salem in 1956 and they were part of this groundbreaking step for Wake Forest. The College came to the City, and Winston-Salem welcomed it with open arms. Ed and Jean remember a beautiful reception held at the Coliseum where all the faculty and administrative staff were introduced to the community, walking down the steps one at a time as their names were read aloud. 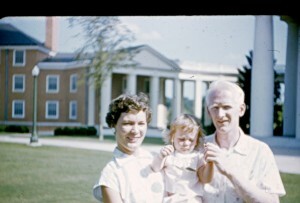 Jean, Ed and baby Carolyn at the new campus in 1958. Ed and Jean chose to move with the college so that Ed could continue in his job as BSU Director, and because they wanted to be part of history. It did mean that Ed had to suspend his studies at Southeastern Seminary with one year left to complete. Ed’s position was now titled as Baptist Campus Minister and BSU Director. He continued his work with the state BSU groups and he and Jean were regular participants in programs at Ridgecrest. Ed and Jean (front row left) were part of an exciting network of NC BSUs. This is from the Student Week gathering in the summer of 1959. Long-timers will also see Bill Smith, John Lewis, Leroy Richardson, Bob Phillips, and many other friends of this time period. The scope of Ed’s work grew as the Chaplain’s office became more prominent. On the old campus, the Chaplain’s job was an extension of the Church pastor’s position. The jobs were separated in 1958, with Dr. J. Allan Easley of the Religion Department as the interim chaplain 1958-1959. L. H. Hollingworth became chaplain in the summer of 1959, serving through 1969. Dr. J. Glenn Blackburn continued as the Wake Forest Baptist Church pastor, blending the group of parishioners who had moved with the new members of the Wake Forest College community. He also developed a new area of professional work, pastoral care. Wake Forest’s medical school — then the Bowman Gray School of Medicine — was already located in Winston-Salem. In 1957, Ed completed the course in Clinical Pastoral Training at the North Carolina Baptist Hospital and Bowman Gray. It was an exciting time to be on the new campus. Ed and Jean lived in the brand-new faculty apartments, a short walk from campus. It was a vibrant community with many other young faculty families. 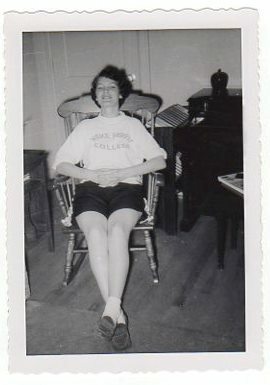 Jean in Apt 3-C, Faculty Apartments, fall of 1957. Yet it was also a dramatic change from the convenient amenities in the town of Wake Forest. The new campus was on a rural tract, far from the city’s downtown, so students had to eat in the cafeteria unless they had access to a car. Some missed the familiar hitch-hike to Raleigh and its big city life. Others reminisced for the spacious rooms they rented from towns-folks and professors. Everyone was glad, though, when the grass began to grow and the mud recede on the campus — and especially to see the first class graduate in 1957. I arrived on campus in the Fall of 1961 to attend the Baptist Student Union Pre School Retreat just prior to freshman orientation. I had no idea of what I was entering. As green as green could be, I had never even seen Wake Forest until that moment. Ed had invited three different thinkers, each representing a different stream of Christian theology. One was a liberal from Duke Divinity School; another, a religion professor from UNC-Chapel Hill holding forth on neo-orthodoxy while the third was the editor of conservative Christianity Today magazine. My roots were Alabama Baptist and three years at a preparatory school that sometimes resembled a crucible for thought control. Suddenly I entered this rarefied context of dialogue, probing, challenging and questioning at a camp on the advent of freshman orientation. I thought I had died and gone to Heaven. It was fantastic. Marvelous. Eye-opening. Ed continued to provide presence, affirmation and trustworthy support in my undergraduate experience. He was a central figure for helping me sort through personal and vocational challenges. He helped me to begin to see myself as worthwhile as a young adult. I now know that all too many university graduates never had such a person as guide. How privledged and how blessed I know I am to have had Ed in my corner. As I was completing preaching and celebrating Eucharist at an Episcopal church this morning in northern Arizona, Ed’s name flashed through my mind. I knew that I am able to do what I do in part because of him. Thank you, Ed.